The demonstration began Wednesday morning around nine a.m. and concluded at about 1 p.m. Vanni district Tamil National Alliance parliamentarian Mr.Selvam Adaikalanathan participated in the protest. 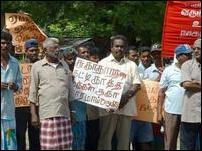 The sanitation work in the Trincomalee town came to a standstill following the demonstration, UC sources said. Health workers residing in the areas of Kasthurinagar, Ghandinagar, Nagarajah Valavu, Manaiyaveli, Poompuhar, Palaiootu east, Chelvanayakapuram and Uthayapuri west participated in the protest. 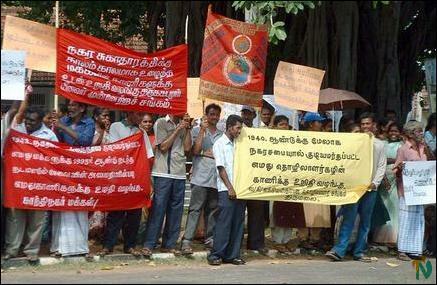 Health workers are living on state and urban council lands since 1942 and all are Tamils. CLC in a statement said that it has brought to the notice of the related civil authorities and parliamentarians the urgent need of handing over deeds and permits for lands to health workers. However, relevant authorities have not taken any steps to fulfill their demand. As a last resort the Consortium has decided to launch the protest campaign, the statement said.